Believe it or not. That’s me, #85, about to tackle the opposing #30 for my high school Westminster Wildcats of Atlanta, Georgia in 1963, not long before the Kennedy assassination. Needing a scholarship to attend college, I played through several shoulder injuries that season to keep the attention of recruiters, and came within two days of signing a grant-in-aid commitment to play for my home-town idol Bobby Dodd at Georgia Tech, which was then in the Southeastern Conference (SEC). Luckily for me, the chance for an academic scholarship at UNC in Chapel Hill came just in time. 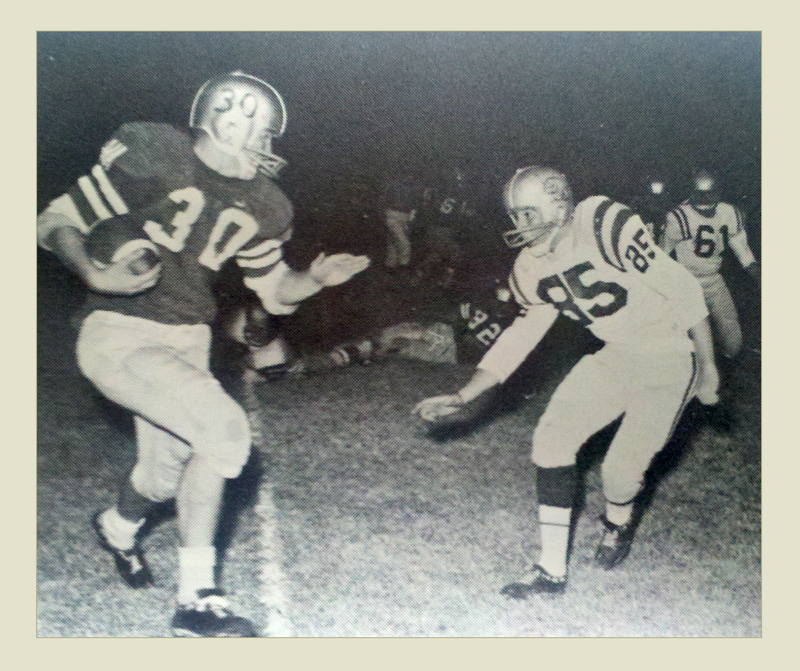 I took it, and reluctantly gave up football, because I knew my body would have a hard slog in the college game. (Tech had talked to me already of having surgery before the fall.) It was a turning point in my life. Forty-eight years later, I agreed to revisit the world of college sports for The Atlantic magazine, this time as a nostalgic outsider to explore the history of NCAA games that seem to be in perpetual scandal. It was quite an adventure. Ours is the only country in the world that hosts big-time, big-money sports events at institutions of higher learning. How and why is a colorful story, featuring the “flying wedge” and unlikely sports nuts dating back to Thomas Edison and Cole Porter. My reform impulse going in was to purify collegiate sport by somehow draining its commercial swamp. To my surprise, I came out convinced that the NCAA’s imposed amateur rules are both phony and unjust. They have blotted out true education beneath callous sentiment. My journey through modern college games was still fun, but discoveries there made me an abolitionist. Many people make excuses for the amateur system, including my former self, but no one justifies its foundation in principle. My report in The Atlantic struck a nerve. In less than a month, it has morphed into an expanded original E-Book published by Byliner.com. This experimental new form has thrust me into high-speed digital publishing, which is quite a change for an old author who once adjusted to the electric typewriter. In the past week, I have taken remedial Twitter lessons in order to follow caroming debates in new social media. College sports and higher education are intertwined. Excellence is endangered in both. Heavily vested interests impede thought even on our university campuses. I invite everyone to tour the hidden wonders and then join an informed debate. I enjoyed the memories in your interview in Atlanta Magazine on growing up in Atlanta, and the piece above. Glad to see that you are accurately recording our youth.